Imagine if every file you share could be viewed online, if every desktop, smartphone and tablet could open the files irrespective of the platform they are running. No need to download the files, no need to install third-party apps to view them. Technology should do the work for you. Two years ago we started developing Jumpshare with this simple mission. We have since come a long way. At Jumpshare, we’ve build a solution that makes it possible to view over 200 file formats online. This does away with all third-party apps built to help you view the files. Jumpshare is a single destination where you can share and view all types of files online – and in coming future – gather feedback and collaborate with people. We started with a quick drag & drop web app in September 2012, moved to free user accounts in February 2013, made it mobile-friendly and introduced the Mac app in July 2013. Now a year later – after 0.5 million successful file conversions – we’re finally launching the much awaited Jumpshare Plus. Jumpshare Plus offer users more storage, better features, unlimited file upload size, support for custom domain and early access to new formats, all for $10 $9.99 per month on a monthly plan or $9 $8.25 per month (paid as $108 $99 per year) on a yearly plan. And we’re just scratching the surface of what we can offer. There’s plenty more to come. So what’s new in Jumpshare Plus? We review some of the new features below. Imagine you want to share a document publicly on a specific day, or have designs sent to a client on the due date, or simply want to share files at a time when you know you won’t be able to go online. 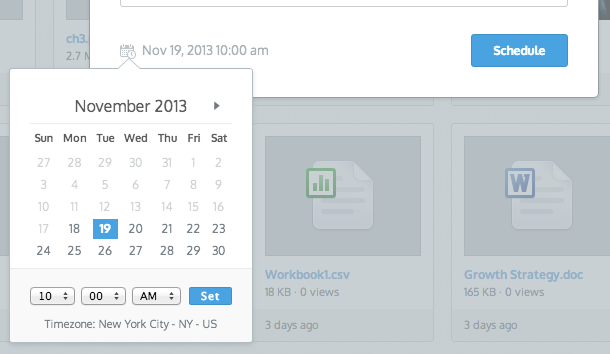 Schedule Share allows you to set a future date and time for sharing your files. Not only can you schedule files to be sent by email but can also schedule to share them on Facebook and Twitter. Google+ and LinkedIn support is coming up next. The shares are scheduled according to your timezone. We automatically detect and set a timezone for you but if you want to set a different one, you can change it from the Settings. A new Scheduled Shares tab is added where you can see the list of all shares you’ve scheduled. From this tab you can edit the shares you’ve scheduled or cancel them. Every file uploaded to Jumpshare has a 20 character long unique URL which is hard to guess, but for super sensitive file, you can add an extra layer of security by locking them with a password. Locked file can be shared on social media or on websites and forums and access can be restricted. There is no limitation on the password length and we support special characters to help you make passwords even more secure. 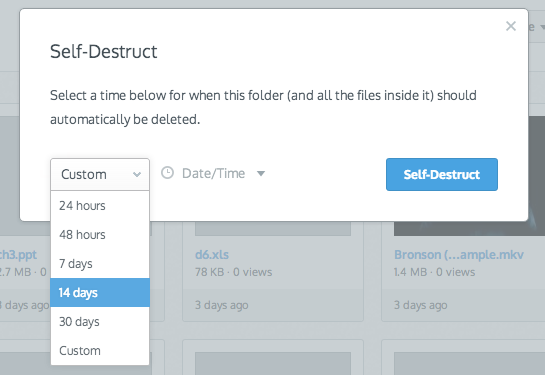 Self-Destruct takes the security of your files up by another notch. In case protecting your files with a password was not enough, you can set your folder to self-destruct after x number of days. Once self-destructed, your folder (and all files inside it) will automatically be deleted. You can choose to self-destruct your files if you’re running a limited time public campaign (24 hours, 48 hours, one week, one month, etc) and want the readers/users to access the files within the timeframe given. If your job requires you to share large amounts of files every month, you can set the files to self-destruct after a few months to free up space in your account for newer files. If you want to give someone limited time access, you have the option to choose both the date and time when setting up the self-destruct. If you have a personal brand or small business, you can now use your own domain name to personalize file sharing and enforce your brand image. Your users, followers, customers, or clients will see your brand name as part of the share URL. 50GB storage, bigger uploads, priority support, and the ability to send files to 100 recipients in one go. And did we mention that Plus users get early access to new file formats? As we continue to expand the number of file formats we support for online viewing, Plus users will get the ability to view them online before Free users (in some cases 3-6 months earlier). The 100MB file size cap is no more; it’s just you and your files. Okay, that’s about everything. Now go upgrade your account! Pretty cool. I like the idea of creative collaboration. Looked over quickly and appears to be an alternative to Cloud App and Droplr. The main difference being that this service appears to be able to display many more file types natively than those other two services. However, as with any new service I try out the moment I see the app and website isn’t retina compatible, I immediately close it out and move on to the next item in my RSS feed. While it makes perfect sense that existing services such as Adobe take a while to update their existing products, I never can understand how a company can launch a brand new service (web service / desktop app) that is not retina compatible. They clearly do not have a retina computer as it looks horrible on those devices which is almost any new macintosh from the past year or two. You only get one first impression and this company made a bad one. Our Mac app is Retina ready for those who have Retina Macbook Pro. When we developed the Mac app, we made it Retina ready. Both the Installation and Tour window are new though and made in a shorter timespan and we’re working on making them retina ready . As for the black logo that loads, that was an oversight on our part and I’m grateful you pointed it out. Please check the Mac app again in a few days. Do keep the feedback coming, it’s valuable to us to continue improving Jumpshare. When we will have dropbox like sync? No plans yet but we’ll keep the users informed when we have some new features in development. Awesome to know about the new features. Great work. Catching up late on this but as always, wonderful progress! Congratulations on this big step.